A thin sheet of clouds advanced from the west, horizon wide and almost imperceptibly slow. The brilliant morning sunlight succumbed silently as harsh rays diffused into a softer light upon a still bright landscape. The wild autumn colors grew richer. By mid morning the sky’s hazy blueness had dissolved into a terrestrial vault of smooth, white vapor. The view from the ridgecrest revealed a stark, new landscape. Amidst a pallet of brown and gray earthtones an alpine wall rose to my left as a ramp of exposed bedrock led me down into a large deglaciated barrens strewn with morainal debris. The footing became jumbled and loose and my pace slowed as I wound a path over and around the tall mounds of rocks and powdery gray silt. My eyes widened as a small pond came into view. 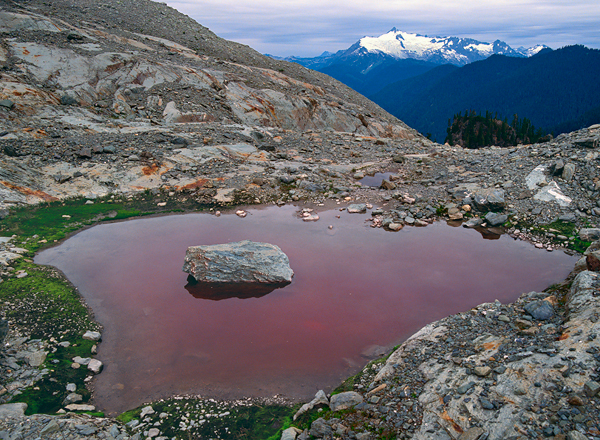 The water was a deep maroon color I’d never seen in water before. A single, large rock sat perfectly in the middle of it, and looking over that rock the distant, classic summit of Mt. Shuksan stared back. The scene affected me powerfully and I stopped to lower my pack. I bent low to peer into the red water and delighted at the brilliant green moss at it’s edge. The alignment of the rock and the distant mountain seemed to suggest a simple truth about erosion and age, about the passage of time and of generations of birth and death. I had a sense of the rock around me and of the mountain as living entities, and I imagined them savoring their own lifetimes, no less than I cherish my own. I rested there for a good long time; looking, thinking and listening to a tantalizing silence.